(Scott Sommerdorf | The Salt Lake Tribune) Utah Jazz guard Ricky Rubio (3) passes behind his back to Utah Jazz center Rudy Gobert (27) during first quarter play. 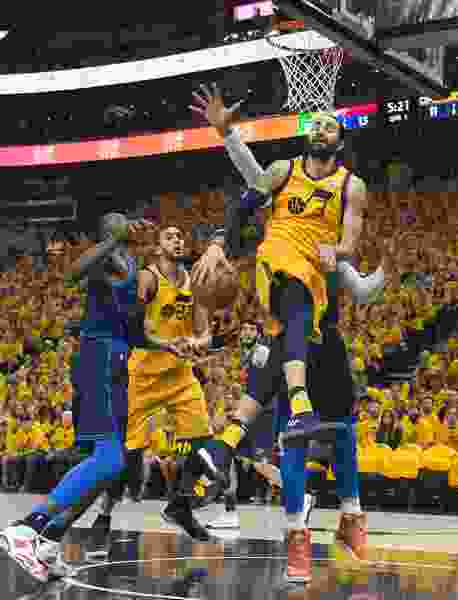 The Thunder led the Jazz 22-18 at the end of the 1st quarter during Game 6 of the first round playoff game, Friday, April 27, 2018. It was too good to be true: Ravaged by injuries for the first half of the season, the Jazz rounded into the playoffs at near-full strength. But the latest blow is a deep wound for Utah’s ambitions to advance to the Western Conference finals: Ricky Rubio, who left Friday’s Game 6 clincher against the Oklahoma City Thunder with a hamstring injury, will miss at least Game 1 against the Houston Rockets, first reported by The Tribune, and he may be out for more than a week. The Jazz already had a small margin for error against a top-seeded Rockets team that swept all four matchups in the regular season. Taking away Rubio, a veteran playmaker who shined in his first postseason appearance, has serious consequences for the Jazz, even though the team managed to clinch the series without him on the floor. After dealing with hamstring soreness late in the season, Rubio took an even-keeled approach to the news following an MRI on Saturday morning: “Never too high, never too low,” he tweeted. That approach was good enough to win Game 6 against the Thunder, as Donovan Mitchell and Joe Ingles split most of the ball-handling duties and Mitchell scored 38 points. But on a night-to-night basis, Rubio’s production could be much harder to replicate: The Spanish guard averaged 16.8 points, 7.8 assists and 8.6 rebounds per game in the series before Game 6. His Game 3 performance was the first franchise triple-double in the playoffs since 2001. He also made an impact defensively against Russell Westbrook, and the Jazz outscored the Thunder by 9 points per 100 possessions with Rubio on the floor. After he left Game 6 in the first quarter, the Jazz struggled to find their footing with nine turnovers in the first half alone. Eventually, coach Quin Snyder said he was able to streamline the offense to suit Mitchell and let him focus on “attacking” as Utah ended up outscoring the Thunder 55-50 in the second half. Rubio’s absence likely opens a starting spot for rookie guard Royce O’Neale, who plays off the ball. Mitchell and Ingles will factor as the primary ball-handlers in the offense. It also opens up more time for bench guards, although that is more uncertain: Point guard Dante Exum saw his minutes decrease throughout the first round with turnover-prone possessions. Alec Burks, long confined to the bench, gave the Jazz an injection of energy on offense in Game 6 with 11 points off the bench. Raul Neto, who has played five minutes in the playoffs, is another option. Whoever sees the floor will have their hands against the Rockets backcourt, which is arguably the most dynamic duo in the league: James Harden and Chris Paul. The two have averaged a combined 48 points and 14 rebounds so far in the playoffs.